Be the first to share your favorite memory, photo or story of Tabatha. This memorial page is dedicated for family, friends and future generations to celebrate the life of their loved one. 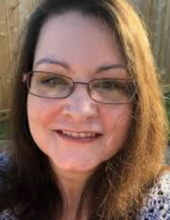 Tabatha Renae (Oliver) Phillips, age 48 of Conroe, Texas passed from this life on Wednesday, January 30, 2019. She was born on December 4, 1970 in Conroe, Tx, to parents Ernest Wayne Oliver, Sr and Brenda (Coleman) Oliver She grew up and spent most of her life in Conroe, Texas and Montgomery, graduating from Conroe High School and later attended Sam Houston State University. She was preceded in death by her parents, Ernest Wayne Oliver, Sr and Brenda Paulette Oliver. Bremerton, Washington. Her brother, Ernest Wayne Oliver, Jr. of Cypress, Texas. To send flowers or a remembrance gift to the family of Tabatha Renae Phillips, please visit our Tribute Store. "Email Address" would like to share the life celebration of Tabatha Renae Phillips. Click on the "link" to go to share a favorite memory or leave a condolence message for the family.